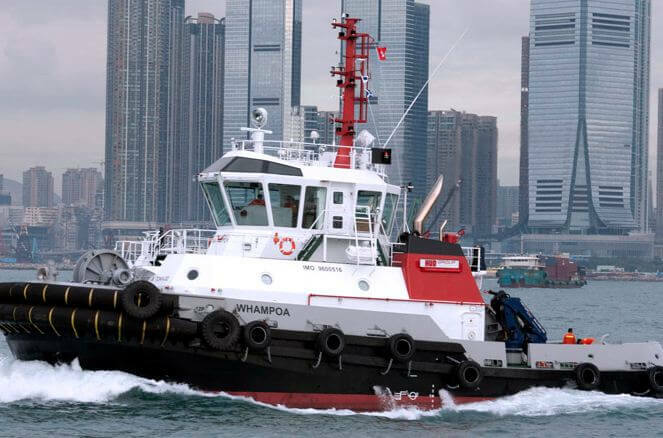 James Chan: Whampoa is the second in a four tug series constructed by Cheoy Lee Shipyards for Hong Kong United Dockyards (HUD). The first was Taikoo which was also named after the two shipyards Hong Kong and Whampoa Dock (founded 1863) and Taikoo Dockyard (1902) which merged to form HUD. The Whampoa is a RAmparts 3000 Class Terminal Support Tug specifically designed for ship assist and coastal towing operations. This vessel is designed to meet the requirements of HUD for operations in and around Hong Kong. This particular version has an extended deckhouse with additional accommodation for the crew and cadets that will be aboard the vessel. The naming ceremony of the tug was held on the 15th November 2011 at Cheoy Lee Shipyards, Lai Chi Kok.